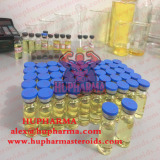 Testosterone propionate is a common oil based injectable testosterone.The added propionate extends the activity of the testosterone but it is still comparatively much faster acting than other testosterone esters such as cypionate and enanthate. Propionate is a popular steroid that shows solid results with few side effects. It is effective because it acts like the body’s natural testosterone, which is responsible for growing muscles in men and women. Testosterone Propionate works because it is androgenic with an anabolic effect. It allows the muscles to retain more protein, thus giving them more bulk. A diet high in protein and a strong workout program are absolutely necessary for gains to occur when using propionate. While cypionate and enanthate are injected weekly, propionate is most commonly injected at least every third day to keep blood levels steady. For strength and muscle mass gains, this drug is quite effective. With propionate, androgenic side effects seem somewhat less pronounced than with the other testosterones, probably due to the fact that blood levels do not build up as high.